Mom and her MacBook – Planet Geek! Mom’s mac mini has been acting up lately, throwing disk errors, refusing to boot, etc. It’s 3.5 years old, out of Apple warranty, and, well, it was time to upgrade. After a brief discussion and a glance at Apple’s refurb listings, we picked up a Macbook. 120gig of disk space, 1gig ram, dual core 2.1gig, combo drive, the whole works – for a mere $850. 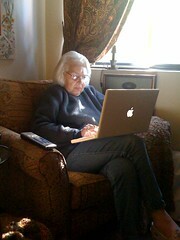 This is Mom’s first laptop, and by appearances, she seems to be taking to it just fine.